The enigmatic body of work by Swiss artist Reto Pulfer (b. 1981, lives in Berlin) might be said to occur at the intersection of architectural space and performance. 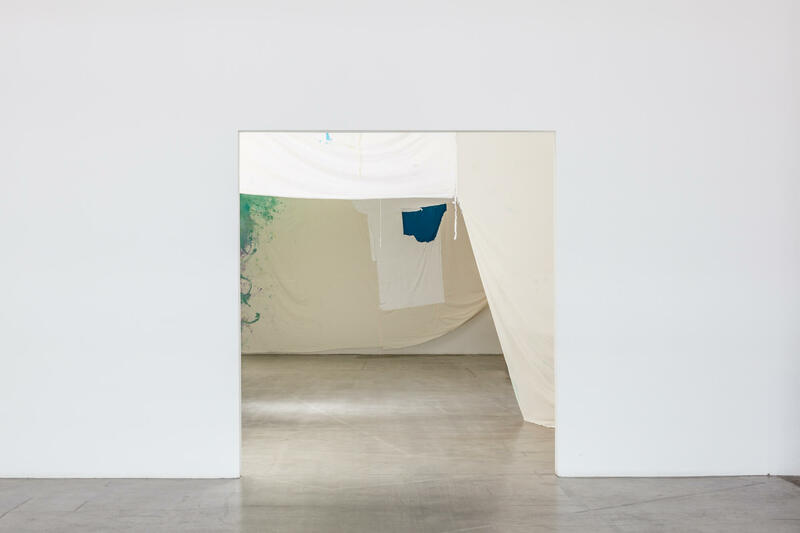 In his first solo-exhibition in the United States, Pulfer suspends large swathes of hand-painted cloth from the ceiling structure, countering the architecture of Swiss Institute’s main gallery while exploring an ethereal environment. Visitors enter into a mysterious sky-lit interior. 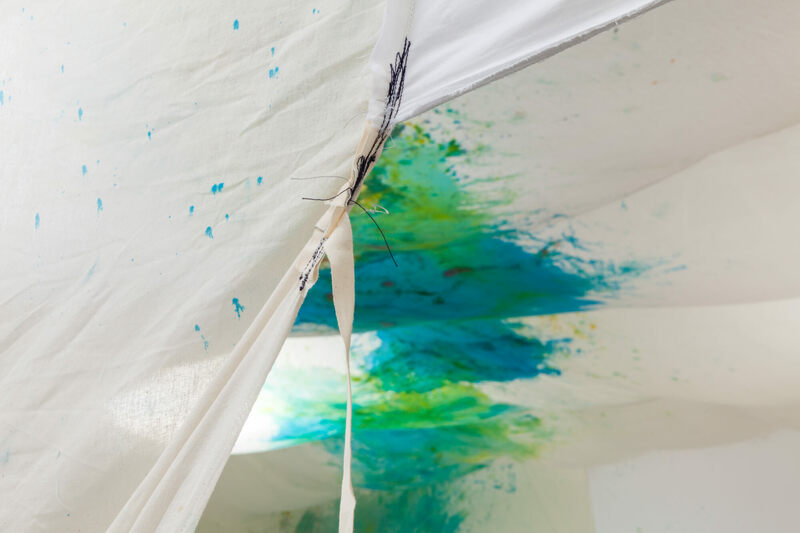 The walls, enveloped in the unbleached cotton cloth, sway with movement, while dramatic pinpoints of swirling color are splayed out on the fabric-covered ceiling. This illuminated starry sky extends in a diagonal band from corner to corner across the space. The exhibition’s title, Zustandseffekte, roughly translated, means the effects of a phase of matter, referring to a contradictory process of both stagnation and transformation. Pulfer innovates ancient rhetoric, deploying it as a compass for his temporary intervention. 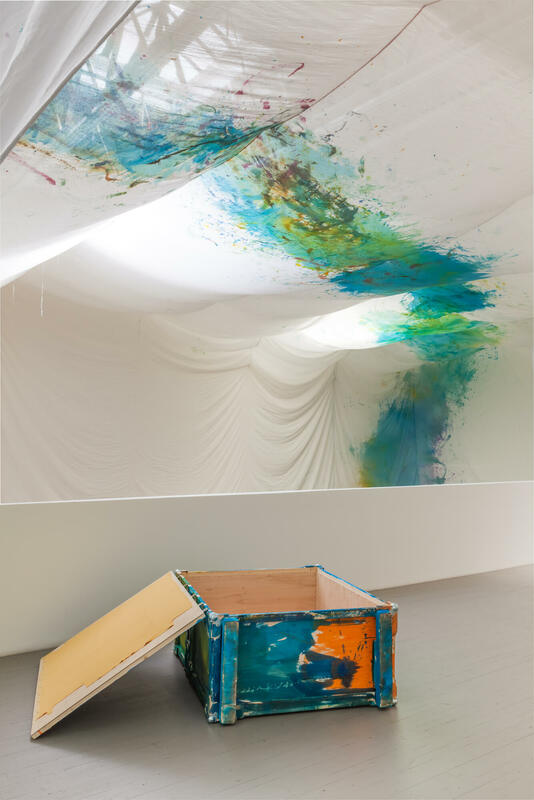 Drawing from the ancient Greek strategy of mnemonics, the artist translates thought patterns into three-dimensional form: secondhand bed sheets, Raku-ceramics, and the handmade crate in which the work is shipped are used as vocabulary. Reto Pulfer has exhibited at CCS Bard College (2013); Kunstverein Nürnberg, Germany (2013); Künstlerhaus Graz (2013); Kunsthaus Baselland (2012); Istituto Svizzero di Roma (2011); and the Museum of Applied Arts / Contemporary Art Vienna (2011), among others.